Wingsinflight - Attracting and providing housing for Orchard Mason and other Solitary Bees. Bees are some of our best pollinators, and 30% of our food supply is dependent on bees for pollination, as well as the fruits and flowers in our home gardens. Right now the Honey bee is in decline due to mite infestation, however, this bee is not our only pollinator - other bees, known as "Solitary" bees are just as hard working but because of their small size they go unnoticed and due to lack of knowledge about these fascinating insects, are greatly under appreciated. In most cases, mention the word "Bee" and most people will be squirming, recalling tales of bee stings and thus labeling all bees as bad. Unfortunately the bees that do sting, such as the wasps, hornets, yellow jackets and occasionally the honeybees, give these other Solitary bees a bad name and instantly cause fear. In most cases bees will ONLY sting if roughly handled. 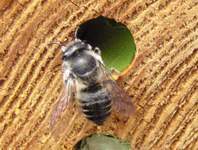 The Solitary bee, depending on the species can nest either in the ground or in holes in wood, such as those made by wood borers, or in handmade nest boxes. 85% of all bees are "Solitary" and they are called this because they do not live in hives and do not have a Queen. Instead they will nest in their holes, one female per hole, but will live alongside other bees. Some of the different species include - Orchard Mason bees (known as Mason bees), Leafcutter bees, Aphid bees and Carpenter bees. 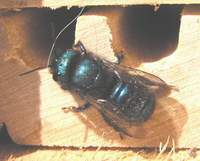 The Mason Bee - Osmia lignaria (photo above) is a small blue / black bee, approximately 10-13mm long, the males being a little slimmer in size and are an iridescent black/blue in color. 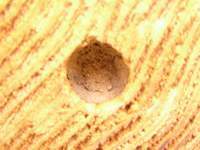 They do not drill their own holes but nest in pre-made holes in wood, either man made or those made by wood borers and woodpeckers, hence their name. There is a lack of suitable nesting places for solitary bees. This is due to habitat destruction and man's obsession for keeping things neat and tidy by removing old tree stumps, clearing up brush and log piles and generally dead wood. However we can help by providing nest boxes. The house on the left is a "High Rise" Mason bee house from Beediverse.com with layers of wood routered with 5/16th holes. This will attract both Mason and Leafcutter Bees. The house on the right has smaller nest holes and is for the smaller Solitary bee such as Aphid bees. 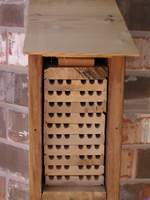 Boxes can be homemade with 6" deep blocks of wood but to help promote healthy populations of Mason bees the use of routered trays is definately the best type of nest box to use. These come apart in layers (photos above) so the cells can be checked for parasites and cleaned out at the end of the season. Short of this, a basic way to make a box is to take a 4x4x6 piece of wood, (remembering that a 4x4 really isn't 4x4, but more like 33/4 x 33/4) such as pine, fir or cedar, (nothing treated or waterproofed). 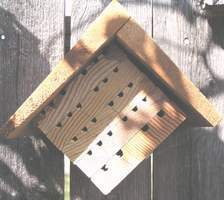 Along one side of this block and with a 5/16" drill bit (the preferred size for Mason bees), you will drill rows of holes about 31/2" deep but not going all the way through. 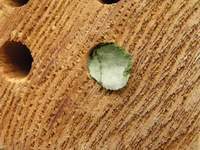 Holes should be drilled as smooth as possible for the bees so take your time in making the holes. They should also be spaced 3/4" apart from the center of the holes. Thus, a 4x6" would give you about 12 rows across and 4 rows down, giving a total of 48 holes. 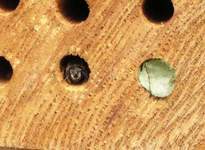 However, with holes only at a depth of 31/2" this would produce mostly male bees as the shorter the hole, the more males. More females are preferred so another way to do this would be to take the 4x4x6 and drill the holes into the end of the wood block, going in about 51/2" deep. You would fit 4 rows across and 4 rows down, giving you 16 holes. This would produce more female bees which is encouraged, so holes between 4-6" deep is recommended, but either way would still attract them. There is one other thing that some people do and that is to use paper straws inserted in the holes. This way the holes can be cleaned out before new eggs are laid and cocoons can be cleaned to prevent mite build up. More information can be found regarding this method in some of the links below. Once finished, place the box in an East or preferably Southeast facing position. They like the morning sun which enables them to fly early and collect pollen. You can attach your box under the eves of your house where it is sheltered, or attach it to a stake and place in the ground among preferably native plants. Plants that have been hybridized to not produce much in the way of pollen and nectar, having been bred for showy blooms instead, so try and stick to the native plants or old varieties. The height would be approximately 3 feet off the ground to avoid water from splashing up. Also tilting the box downwards slightly will help to protect from rain. You can also place a roof on the top of the box to shelter it. Make sure you place your box in a spot where you can observe the bees at work but in a spot where it will not be disturbed or knocked. Do not worry about standing near the box while they are nesting - they will fly around you and pay you no attention! Finally - DO not place near plants that have had pesticides sprayed on them and do not use any pesticides or herbicides until at least after the bees have finished nesting. 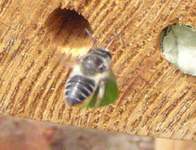 Female Mason Bees begin nesting in early spring, around mid March here in North Central Texas. They will mate and then will begin searching for nest holes to lay eggs in. Once they find a suitable nest site they will gather mud and begin making a cell in the deepest part of the hole. This is done at the perfect time when fruit tree blossoms are at their peak. They then will place a block pollen in the cell. On top of this they will lay 1 white egg and then seal the cell with more mud. They will repeat this until the length of the hole is filled with approximately 6 cells, or chambers, each time laying one egg and a block of pollen. After her eggs have been laid she will die. The adult part of a bees life only lasts for about 6 weeks. The small white eggs will stay at this stage for about 1-3 weeks and then hatch. After this they grow quickly, feeding on the block of pollen given them. The larva will then change into a pupa and will remain this way in hibernation for anywhere up to 9 months over the winter. The following spring they will hatch out beginning with the last born, which is at the entrance of the hole. He (most eggs at the front being males) will chew his way through the mud door and the one behind him will then come forward. If the one at the back is awake before the one in front she will chew her way out and then nip the back end of the bee in front, encouraging that one to move forward! Once all the bees have emerged the cycle begins again. 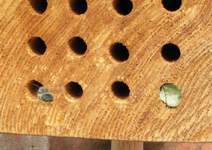 The first year in using my homemade box, as well as having two nest holes being used by Mason Bees I also attracted a couple of Leafcutter bees. Like Mason Bees and just as fascinating, Leafcutters have a similar nesting style and will nest in the same wooden bee boxes except, as their name suggests, they line their cells with small pieces of leaves instead of mud. It is these bees that will leave those little chewed edges on your Roses! They also will take leaves from other plants that produce smooth, thin leaves such as Ash trees, Redbuds & Bourganvilleas, even the petals from plants such as Crepe Myrtle's. They will nest through the summer peaking around June/July. Left to right: Here one of the holes has been filled with cells and sealed with the final cap of leaves. 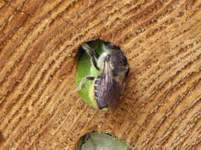 A Leafcutter bee defending a hole. Leafcutter leaving the nest to gather more leaves. Bringing in another leaf & postitioning the leaf toward the front of a second hole for a good seal. Here you can see how the bee curves the leaf under her abdomen for flying. The yellow under her abdomen is pollen caught by the stiff bristle like hairs. Finally she positions the leaf and the entry hole is almost complete. A final cap will finish it like seen in the first photo. Left: Here a new adult bee has eaten its way out to the entrance and is getting ready to leave. Notice how yellow its head is compared to the adult above. Right: I stuck a piece of leaf to the box just so I could watch the bee walk onto it and had time to take a quick photo before it flew off! Click on this photo to enlarge. The dates for the bees above were: First nest hole completed April 14th '03. First new bee seen leaving the nest May 17th '03. 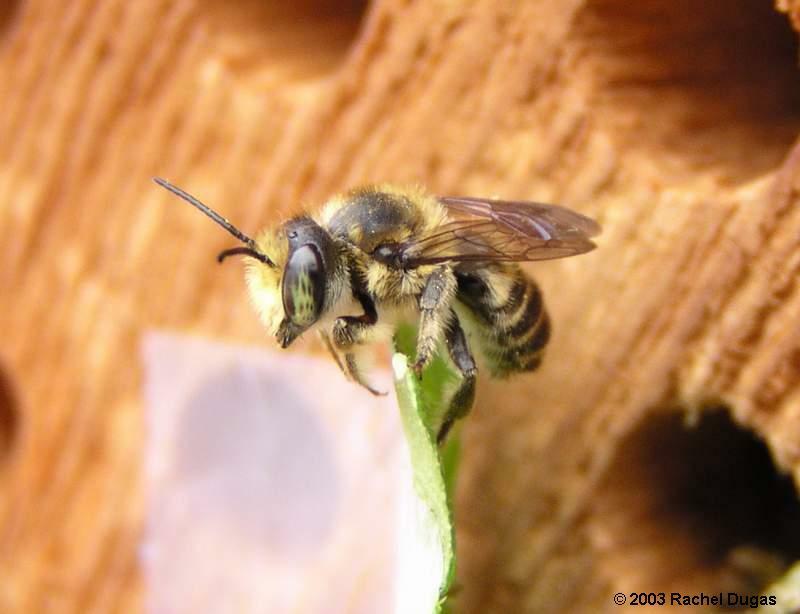 Unlike Mason Bees which are blue-black in color, Leafcutters are similar in size & color to honeybees, with stripes going across their abdomen in shades of black, grey and tan. They do not collect pollen on their legs like honeybees but instead the females have stiff bristle type hairs on their abdomens designed to trap the pollen from the flowers they visit, coloring them yellow. The males do not have these hairs and his font feet are white. Soon after mating the male bee dies, the female living for approximately 2 months to lay eggs. 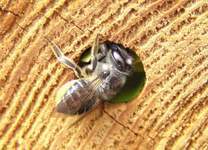 Like the Mason bee she will nest in pre-made bee houses with holes from 4"-8" deep and will make 12-15 cells, each cell lined with approximately 15 pieces of leaf with a loaf of "bee bread," a mixture of pollen and nectar placed in each cell, on which an egg is laid. They will make one cell per day on average. The larva will hatch after a few weeks and feed on the bee bread left for them. They will then turn into a pupa and depending on the species, & if eggs were laid early enough in Spring they will hatch a few weeks later. If the eggs are laid in late spring/early summer they will remain as a pupae through the remaining summer and winter until the following spring. They will then pupate, chewing their way through the leaves and emerge as adults about 3 weeks later, the males which are in the front cells emerging first, followed by the females in the deeper parts of the nest. The cycle will then start again. The Native Leafcutter Bees are excellent pollinators of Alfalfa and one particular small species of Leafcutter bee was introduced accidentally into North America from Europe which does this job very well. These bees are used to pollinate crops of alfalfa, each single bee doing the job that would take many honeybees to do. They also have the advantage that they do not seem to get the mite problems that the honeybee does and they do not have the painful sting like that of a wasp, hornet or honeybee, which is good when humans are working in confined areas such as greenhouses alongside pollinating bees. 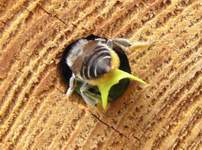 For more info on these fascinating Leafcutter Bees and other solitary bees check out some of the links below. Also, you can click here to see an assortment of Bee & Wasp Photos that I've taken. Below are several links to great web sites containing all sorts of information regarding bees. 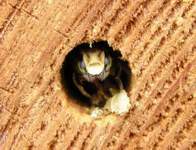 There are variations on nest boxes as well good photos of the different species of bee. Knox Cellars, Native Bee Pollinators. Useful information on Bee keeping and Solitary Bees. Pollination Information on Bees, photos and plant database. Guests and members interact internationaly. 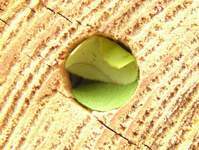 Pollination, bees and "Binderboard" nest boxes.